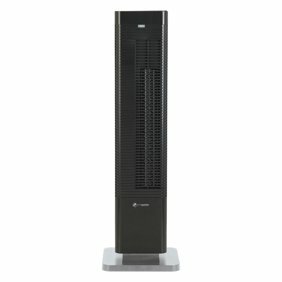 The Honeywell EnergySmart Infrared Whole Room Heater uses six long-lasting quartz elements to produce quiet, efficient, even heating for extra-large spaces. Its stylish design compliments any room in your home and provides excellent safety features including: overheat protection, Cool Touch housing and 4 way tip-over protection which automatically shuts the heater off if tipped in any direction. It also offers top located digital controls with two constant heat settings, a programmable thermostat for precise, personalized comfort and EnergySmart technology, which helps regulate power consumption and can save on energy bills vs. conventional heaters. The Honeywell Energy Smart Infrared Heater is a very efficient, quiet and fast way to add warmth to large spaces. The infrared has 6 quartz elements and is specifically designed for extra large rooms. A clean and cheap way to supplement your homes heat supply. It has a programmable heat and thermostat settings, and an automatic shut off built right in. This makes it perfect for business' or homes. This model comes with a remote control so you can access it from the comfort of your chair, very easy and convenient. The digital panel has manual controls and a large lit LED display for easy setting. I am able to use the two settings, Low uses 1000 watts, and the high uses 1500 watts of power. The casing is cool to the touch and has a handle on the top for moving or adjusting your unit. It is designed with safety features such as an automatic shut off in case of accidental tipping, the plug is a grounded three prong plug, and also built in protection that prevents the unit from over heating in order to keep you and your family safe. This infrared heater has casters [wheels] on the bottom for ease of re-positioning. It weighs about 20 lbs. and is fairly good size. It is about 12" wide, 15 1/2" deep and right at 16" in height. I choose this heater because I have a completely open floor plan in my home. Kitchen, dining, living room and family room. When I am up during the day I turn my heat pump way down and these rooms get very cool so I set my Honeywell and it takes the chill off of all four rooms very well. The settings allow for heating with the space heater alone or to set lower to accompany my heat pump. It will adjust to about 60 degrees up to about 83-85 degrees. The large LED display also shows your energy usage at any given time. This model all has a permanent filter to help prevent dirt and dust from getting into the unit. I am not sure exactly how much it has saved me on my heating bill but so far I would estimate approximately 1/4 of my usual bill so far. The Honeywell Infrared is the best space heater that I have come across. I would highly recommend this model for any large and drafty areas. Honeywell Smart Energy Heater HZ 970 Includes: A remote control. A button, cell type, remote control battery. Owner's manual. Light weight and compact. Weighs 12.65 lbs. Has a handle and caster wheels. Has a “cool touch” plastic housing with a remote holder under the handle. 120 volts. Uses 12.5 amps. Settings: Power-on-off Fan-just cools down the quartz heating elements when you turn off the heater. Will blow for about 1 minute or less. L1: constant low-1,000 watts. The most energy efficient setting. L2: constant high-1,500 watts Timer: can set heater to run from 2 up to 8 hours. Heater will automatically shut off after the set time has passed. Has a safety feature which will shut off the heater if it gets tilted or falls over. I picked mine up by the handle to move it and the heater shut off. It has easy, simple to use controls with LED readings. This heater also has an air filter on the back behind the air filter door. They suggest cleaning the filter by vacuuming it once a month. There is also chord wrap knobs on the back to wind your chord around for storage. I tested the heater in my small 240 sq. ft. living room. Shut off the main heat source in my house. The temperature outside was 54 degrees so it wasn't real cold out. I used the manual controls, not the remote. When I pressed the power button the LED showed the room temperature as being 69 degrees. I'm not sure how accurate it read the room temp. because the thermostat on my home's central heating system is not very accurate. It started on L2-the high setting. I manually set it to low-L1. It ran very smooth and quiet, which is great for running at night, so it won't disturb your sleep. After a couple of hours I checked the room temp. and it was up to 74 degrees. Comfortable. I'm sure this is not meant to be used as a sole source of heat in your home but good to keep smaller rooms in your house warm. I have an older 2 story home, and in winter, some of the rooms are colder than others. Especially one of the upstairs bedrooms. This HZ 970 heater would be perfect to use in there. Nice and quiet little heater with safety features. I recommend using in smaller rooms for the best use. I loved how I was able to stay warm and snug under the covers while warming up the bedroom, by using the remote control. This way I didn't have to wake up to a room that is so cold, it makes you want to stay in bed all day long! Using the (included) remote, I turned the Honeywell Energy Smart Infrared Heater on, used the up or down arrows to select the EnergySmart thermostat and set it to a temperature that was comfortable enough for me to stick my toes out from underneath my warm blanket. It will show me the Current room temperature on the left side of the lighted display, and the Desired room temperature on the right side. As the Current air temp approached the Desired temp, the heater will automatically adjust the power consumption to provide consistent warmth without wasting energy. I noticed that the display for the EnergySmart thermostat cycles through “high”, “low”, “fan” (no heat) and “at temp” (which means it has reached the desired air temperature and the heater shuts down at this point). When the Current air temperature dropped back down below what I set the Desired temp at, the heater turns back on, blowing the warm air around the room again. The timer allows you to set the heater to run for 2, 4, 6, or 8 hours in the selected mode, (Constant Low - L1) or (Constant High - L2) or EnergySmart. The timer counts down the hours and automatically shuts off with a polite “Beep” to let you know it's shutting down. What's good about using the EnergySmart thermostat instead of the constant low (L1) or constant high (L2) heat, is that you are saving up to 25% in energy bills! You can estimate the cost to operate the heater to determine if this is the one for you by multiplying the watts used times .001 to convert into a kilowatts measure and then multiple that by what your local electric company charges you for a kilowatt hour. Example: My local electric company charges $0.046040 per kilowatt hour in the wintertime. (I found this on my electric bill) So if I ran the heater in constant high mode (L2) (which uses 1500 watts), for 4 hours, it would cost me $0.27 (1500 watts x 4 hours x .001) x (0.046040) = 0.27624 Running the Honeywell EnergySmart Infrared Heater in Constant Low (L1) or EnergySmart settings is more energy efficient and might be a better choice if you are concerned about too high of a draw on a circuit because they only use about 1000 watts compared to Constant High (L2) which uses 1500 watts. Those two options will also save you money. Using the formula above ((total wattage x 4 Hours x .001) x Cost per Kilowatt hour = Cost To Operate), and the wintertime kilowatt hour charge from my electric bill, it would cost me $0.18 compared to the $0.27 cents that the Constant High would cost. NOTE: Both the heater unit AND the remote has all the same buttons, so you can do everything with the remote that you can do on the unit control panel. Also, the remote has a “holder” underneath the handle of the heater so you don't have to worry about losing it. I really do like this Honeywell EnergySmart Infrared Heater and HIGHLY recommend it for someone who needs more heat in their home. As long as you have a clear, flat space to set the heater that's at least 3 feet away from any wall, you are good to go! WE'RE READY FOR "EL NIÑO"! The forecast is for a very cold, very wet winter and I was looking for a way to keep our large family room nice and toasty. I definitely did not want to turn on the furnace and heat up our entire house when we're usually all in one room watching TV at night. The Honeywell HZ-970 is perfect for us. Pros: Simple-to-understand instructions. No setup required and pretty quiet to run. Also, very easy to use with their handy remote control for us "couch potatoes"! The display is even angled so we can read the numbers while sitting down!! It's portable and, if we don't want to lift (with our knees), it has wheels. We like to keep things at a cozy 72°. Now we can set the temperature and let the 970 find the Energy$mart way to keep us happy and help keep our PG&E bills (I hope, up to 25%) lower. Have not gone through a long cold spell yet, but we've had it running through a couple of nights and it has done very well. It powers on quickly and can bring the temperature up within a few minutes. It then cycles on and off to keep us at an even 72. Cons: None so far although I will say.. it's on the boxy side, and not so small. We've tucked ours into a corner and it still manages to keep everyone warm. Last Words: It seems a good "investment" and I'm hoping to see some significant "returns" when we get our gas and electric bills come November and December! I REALLY LOVE THIS PRODUCT ITS A NICE COMPACT SIZE AND IT WORKS SO WONDERFULLY TOO I USED IT IN MY LIVING ROOM TODAY. AND I HAD IT ON L2 SETTING IT GOT SO HOT THAT I TURNED IT DOWN TO L1 AND IT WAS PERFECT FOR ME. I HATE BEING IN A HOT STUFFY ROOM IT WAS JUST RIGHT, AND MIND YOU MY LIVING ROOM HAS NO DOOR IN IT AND IT WAS HOT MY LIVING ROOM. SO IMAGINE IF MY LIVING ROOM HAD A DOOR OMG IT WOULD REALLY BE TOO HOT FOR ME. I LOVE THAT YOU CAN SET THE TIMER ANY WHERE FROM 2 ,4, 6, 8 HOURS OR IF YOU DON'T WANT THE TIMER ON ITS FINE AS WELL. THE ENERGY USAGE INDICATOR DISPLAYS THE AMOUNT OF THE ENERGY USED AT ANYTIME IT GOES FROM FAN, LOW, HIGH. I LOVE IT HAS WHEELS ON THE BOTTOM TO MOVE IT FROM PLACE TO PLACE AND IT ALSO HAS A HANDLE TO PICK IT UP AND BRING IT TO ANOTHER AREA IN YOUR HOME. WHAT I LIKE ABOUT THIS HEATER IT HAS A DIGITAL DISPLAY AND ITS EASY TO READ AND USE AS WELL. THE CORD IN THE BACK OF THE HEATER CAN BE PUT AWAY NEATLY, NO CORD HANGING OUT NOR ON THE FLOOR NEITHER DANGLING AROUND THE HOME. THIS HEATER ALSO HAS A REMOTE CONTROL THAT YOU CAN STORE IT AWAY NEAR WHERE THE HANDLE IS IT HAS A SMALL COMPARTMENT THERE TO PUT IT AWAY SO YOU DON'T LOSE THE REMOTE CONTROL. THIS HEATER IS QUIET YOU DON'T HEAR LOUD NOISES COMING OUT OF IT AT ALL. IT'S ALSO ENERGY SMART IT'S MADE TO SAVE YOU UP TO 25% MONEY ON YOUR ENERGY BILL NOW WHO DON'T WANT TO SAVE MONEY WE ALL DO. THIS HEATER IS MADE OF INFRARED TECHNOLOGY TO CREATE SAFE, COMFORTING, WARMTH WHILE PROVIDING ENERGY EFFICIENT HEATING GREAT RESULTS AS WELL. I LIKE ALSO THE FACT THAT YOU CAN USE IT WITH YOUR SMART PHONE TO PROGRAM IT AND PICK THE HEATING SETTINGS THAT YOU DESIRE AS WELL. I LIKE THE SMART ENERGY USAGE INDICATOR ALOT BECAUSE THE SETTINGS ARE AWESOME IT GOES FROM L1-CONSTANT LOW HEAT, L2 CONSTANT HIGH HEAT, 60 TO 85 - ENERGY SMART ITS MADE FOR YOU TO SAVE MONEY ON ENERGY BILLS. THE FILTER ON THE BACK OF THIS HEATER SHOULD BE CLEANED AT LEAST ONCE A MONTH WITH A DRY CLOTH DON'T USE WATER, WAXES, POLISHES OR ANY OTHER CHEMICAL SOLUTIONS NEITHER. YES I DO RECOMMEND TO TRY THIS HEATER ITS AWESOME ITS NOT BIG IN SIZE AND IT DON'T TAKE UP A LOT OF HOUSE SPACE NEITHER. AND IT WORKS LIKE IF IT WAS A BIG HEATER THAT IS WHAT I LOVE ABOUT IT AND IT'S PERFECT FOR EXTRA LARGE ROOMS TOO. MY PERSONAL OPTION IS I SIMPLY LOVE THIS HEATER AND I WILL BE USING IT A LOT WHEN MY PLACE FEELS COLD TO ME TRY IT YOU MIGHT LIKE IT AS WELL TOO. This heater is fantastic. I live in a split level home and the downstairs is a finished living area. Living room, bar, bedroom and bathroom.....We had a few cold nights last week and in split levels, the downstairs can get a little bit cold. I turned on the heater and it tells you right away what the temp. is in the room and it was 68 degrees. Just a little too chilly to be comfortable. I went and selected the manual temp control and set it to 72 just to see how quickly it could heat up this large open area. It did a great job. It only took an hour or so before it hit 70 and then another 30 minutes to hit 72....which turned out to be a little to toasty for me. It is a good size, not too big, so you can put it in a space that it won't be tripped over. I really like the safety features on this heater too. If it moves in any way it turns itself off. It comes with a remote control that of course we had to try out and it worked great from the couch which was about 5 feet away from the unit. When you are not using the remote the is a nice little spot for it right under the handle. It run very quiet too. When you power it off it has a 60 second cool down period where the fan just runs and coold it down before turning off. I am really impressed with this product and I would recommend getting one for that area that just needs to be a little warmer. INFRARED WARMTH IS THE BEST! The Honeywell Energy Smart Infrared Heater has met all my expectations. It heats the room comfortably while the unit does not get hot to the touch. This is especially important with children in the area. The heat is comfortable and spreads throughout the room. The design is attractive and blends well with my furniture. It can be set to continually warm at a low or high speed or be set to stay at a particular temperature. The digital LED display shows both the temperature of the room and desired temperature. It also has an indicator showing high or low energy usage. The timer on it comes in very handy when I want to set it and not be worried about remembering to turn it off later or if I want to go to sleep and not leave it on all night. It is very quiet. I found it a great way to heat a single room where I am while the rest of the house is cooler. There is a remote control. My wouldn't work at first, but after taking the battery out and putting it back in, it worked. The remote comes in handy if I want the room a little warmer or cooler and don't want to leave what I am doing to go over and push the buttons. It will also turn it off and on and put in the desired settings. My favorite part is, when I am really chilled, I can sit right in front of this heater and warm up within 5 minutes. The fan distributes the heat sufficiently so it is not too hot and yet can warm me thoroughly. The infrared technology behind this energy smart, whole room heater is not new, though it is rather innovative compared to other space heaters on the market. Six quartz elements heat the inner metal chamber. A fan draws in air by the back vents which passes through the warmed copper heat exchanger then exits the front introducing comfortable, efficient, non-drying warm air into the room. The quartz elements have a life of 20,000 hours. That's a heck of a lot of heating time. This product really surprised me with its abundance of convenience features. It's obvious some serious thought was put into it. Although there's a filter in the back that requires some monitoring, this filter does not have to be replaced unless damaged. It can simply be cleaned with a household vacuum. I wasn't looking forward to buying filters for yet another appliance in my house, so this was a big plus in my book. The heater is easily transportable with a stay cool handle. Even the sides and top of the plastic exterior remained cool while it was running. Casters under the unit also assist with portability. There's a place to store the cord in back along with the remote control. It's a minor feature but it makes it much less likely you will lose the remote from season to season when there's a special spot for it. The remote utilizes a watch battery for power. Unfortunately mine arrived with the battery dead but I just slipped a new one in and we were good to go. There are all kinds of protections with this heater. Tip over protection in the way of a four way switch that shuts off the unit if it's likely to fall over in any direction. It also offers overheat protection which will cause it to shut down before it becomes a fire hazard. There's a 3 year limited warranty on this heater. Now to test it out. I knew with 5200 BTU's of heat, it could easily heat a small bedroom, but I wanted to give it a challenge. It was a rainy, damp, windy day and with no heat in the house, it was a chilly 56 degrees in my open living room. I plugged the Honeywell into a dedicated power outlet (the unit draws over 12 amps so its best to use a line dedicated just to it) and set the goal temperature to 68 degrees. The heater tried valiantly to reach it. In an hour it was 61 degrees. Another hour and it was still 61. A third hour and it was wavering between 62 and 63. Im not sure if it would ever be able to heat the room past that no matter how long it was left on, but like I said, this room is a challenge. It's a 20 foot living room with high ceilings that opens into a small dining room and kitchen and there is no way to close off these rooms from the living room to contain the heat. I realized this would be extreme conditions, but I wanted to see how the Honeywell would fare. At least it removed the dampness and got the room to a more comfortable temperature. I set it up in the 12x14 bedroom just to be sure and it had no trouble in heating it to temperature quickly. I like the fact that you can either leave it on low (1000 watts) or high (1500 watts) constantly or dial in a certain temperature to the thermostat and it will stop when its reached and only turn on again to maintain it. This is the energy saving feature of this unit. If you need to run the heater at night, there's a timer that ranges from two to eight hours. This model also offers a gauge showing your energy usage. I thought the unit put out a nice, gentle flow of air. Not blazing hot that will roast you as some other space heaters do. I think it might help if the fan was a little stronger in order to push that heated air further into the room, but it still works very well for the size and the price. I would definitely recommend it. This heater was easy enough to get out of the box and set up as there is very little setup required. A slight indent in the front of the unit would have made it easier to pull out of the box as it only has a handle on the back but tipping the box over helped. The built-in casters are great, it moves easily and there is no assembly required at all. There is a remote control unit included which stores in a very clever spot under the handle. This is appreciated, my other heater doesn't have a spot for it so it lives in a plastic bag with an identifying card so I know what remote it is. That's the good news. The bad news is that the remote didn't turn the heater on or change any settings when I tried it. The plastic tab has been removed so that wasn't the problem. The controls on the unit itself worked just fine and were easy to do so I probably won't even call about the remote issue. Placement is important, you need to place this three feet from anything and a foot around the sides and back. This takes some planning to place appropriately in smaller rooms. It says you should face it into the center of a room which makes sense for safety and efficiency. Wherever you place it, be sure to check it frequently until you know how the heat affects anything around it just to be sure. I placed it so that the low heat was blowing a gentle stream at my legs while I was working on the computer in a chilly room. It was very pleasing to feel the heat and the fan noise is low and consistent, easy to get used to, and I could still hear the radio with no problem. I did not detect any "new unit" smell at all. The orange glow from the heating rod inside is nice. Quick note... don't place under a smoke detector. Mine went off in about 30 seconds after turning the heater on, so I know it is working just fine! A 45-degree turn solved that issue. I adjusted the heat setting down to 2 degrees lower than the current temperature and the heating element shut off within seconds while the fan kept running. I will keep my eye on the electric usage and may use this unit to heat the room while the electric radiators are heating up as they will keep the room warm inexpensively. This unit heats the room up quickly which they can't do.